The romance of New Orleans blooms in full flower at this undeniably charming restaurant housed in a French-Creole building from the 1800s. 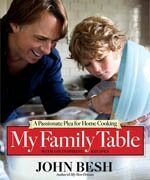 Chef-owner John Besh grew up in Southern Louisiana on an intimate basis with its unique culinary heritage and local ingredients. His contemporary French menu puts an haute Creole twist on local wild fish and fine boutique meats, and ends with an exclusive Southern artisan cheese plate.